SEATTLE--(BUSINESS WIRE)--Apr. 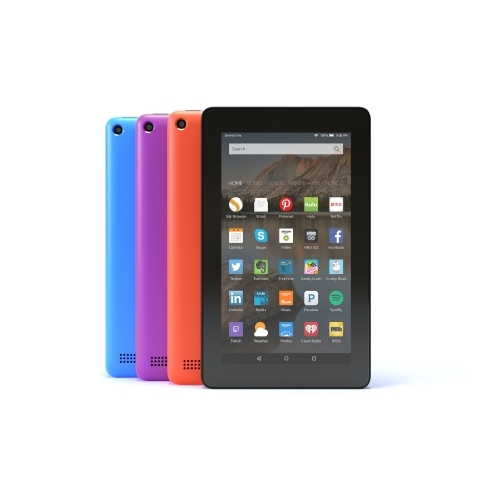 21, 2016-- (NASDAQ: AMZN)—Amazon today announced that Fire, Amazon’s fastest-selling tablet ever, is getting even better with new colors and more storage options. Fire will be available in three new colors: magenta, blue, and tangerine, and with either 8 GB of internal storage for $49.99 or with 16 GB for $69.99 so that customers can take even more movies, TV shows, songs, books, apps, and games with them on-the-go. The new Fire colors and storage options are available starting today at: www.amazon.com/fire. Fire Kids Edition will also be available with 16 GB of internal storage for just $119.99 starting today at www.amazon.com/FireKET. Beautiful 7” IPS display—A great viewing experience with vivid and accurate color reproduction that can be seen at all angles. Quad-core 1.3 GHz processor—Quickly and easily switch between apps, stream movies, and browse the web without waiting for your tablet to catch up. Front- and rear-facing cameras—Video chat with friends and family with the front-facing camera, take and share photos, and save them for later with free, unlimited cloud storage for all photos taken on Fire devices. Up to 128 GB of expandable storage via microSD—In addition to internal storage options, with support for microSD cards, Fire offers plenty of storage to enjoy even more videos, music, games, and photos while offline. All-day battery life—With up to 7 hours of mixed use battery life, Fire gives you the flexibility to go wherever the day takes you. Fire OS 5 “Bellini”—Including an updated user interface that replicates the look and feel of a magazine, making browsing and searching for your content easier than ever. Blue Shade—Uses specialized filters to limit exposure to blue light for a more comfortable nighttime reading experience on a tablet. World’s best content ecosystem—Access to 38 million movies, TV shows, songs, books, magazines, apps, and games—with free, unlimited cloud storage for all Amazon content. Because we don’t want kids to miss out on the fun, we’ve also added a new color and storage option for Fire Kids Edition. Already available in pink or blue, Fire Kids Edition is now also available with a green kid-proof case, and parents can also choose between a Fire Kids Edition with 8 GB or 16 GB of internal storage. Fire Kids Edition comes with one year of Amazon FreeTime Unlimited featuring over 10,000 age-appropriate books, videos, educational apps, and games, access to over 40,000 hand-curated YouTube videos and websites, and our same 2-year, worry-free guarantee—if anything happens, simply return the tablet and Amazon will replace it for free. Fire Kids Edition is available with 8 GB for $99.99, and starting today, with 16 GB for just $119.99 at www.amazon.com/FireKET.